In Golden Times is the first book of my collection. My musings began in June 1997 in my mother tongue Urdu, but gradually expressing more spontaneously in my second language English, during the New Year 1998, to continue unabated. Now my diary of poems is to its brim. 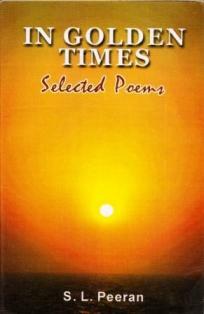 I have emboldened myself to initially publish one hundred and one poems; Haikus & Tankas in this collection. "Like Blake, Peeran sees the world in a grain of sand and Eternity in an hour." "An administrator lisping in numbers may sound strange but Muse in Peeran has blossomed into many – splendoured exuberance in this collection of poems - IN GOLDEN TIMES. Every moment of Time is a mountain. Invisible, magical realities beyond our senses, float out of the unconscious, when the boundaries between the self and world are crossed. It opens expanded moments. The poet dives into these moments - one with nature, its darkness and mystery. Thus poems gleam as magical chalices, reality winking at the brim. Here in this collection, there is self-discovery, new grounds to liberate emotions."